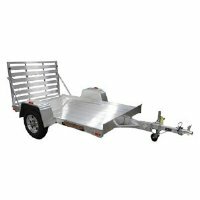 WE HAVE OVER 100 ALUMINUM TRAILERS FOR SALE AND IN STOCK! ALUMINUM CAR TRAILERS, ALUMINUM LIVE STOCK TRAILERS, ALUMINUM HORSE TRAILERS, AND ALUMINUM EQUIPMENT TRAILERS IN STOCK NOW! FEATHERLITE, FRONTIER, ALUMA, EBY, FLOE, AND CARGO MAX ARE THE BRANDS WE STOCK. We will be happy to help you decide which aluminum trailer is best for you. Let our experience and friendliness work for you! CALL US at 618-242-0800 and ask for Karl. He is our resident expert on aluminum trailers!